Two different sites under the same domain. How’s that sound? It may sound like a dream come true if you want to use WordPress for your blog content but are restricted to another domain or enterprise website. The solution is easier than you might think: use a WordPress Reverse Proxy. Here we’ll explain the ins and outs of reverse proxies for WordPress — what they are, why they’re helpful, and how to set them up. What is a WordPress Reverse Proxy? While explaining how it works is a little more difficult, the essence of what a WordPress Reverse Proxy does is simple. It allows your WordPress site to be viewed through another domain, so that your visitors have no idea they’re on a different site or system. For example, let’s say you have a WordPress blog at MyAwesomeBlog.com. But you want to consolidate your blog with your main site, MegaSite.com. A WordPress Reverse Proxy will allow your blog to show up as something like MegaSite.com/Blog. This appeals mostly to enterprises, who have large and pre-existing sites already set up and don’t want to move everything to a separate WordPress site. There are other uses, though, such as sites locked into an external domain for one reason or another. Commonly, these are small and mid-sized retailers using a secondary eCommerce platform. Whatever the reason, if you have two separate sites, it pays to merge them together. Here’s why. The main advantage of reverse proxies is unification. You no longer have to redirect visitors off-site or bounce them around between two sites. This disorganization can get confusing and takes away from a brand’s credibility and professionalism. Combining the two sites gives a “no hair out of place” impression, even if it’s just a illusion created by the proxy. The benefits of unifying your sites goes a lot deeper than superficiality. Merging your two sites has a great effect on SEO. This is less of an advantage and more about avoiding a disadvantage: if you have two separate sites, you’re dividing your SEO efforts by half. This is an inefficient use of your energy that can be rectified with a WordPress Reverse Proxy. Combining your sites allows their SEO values to work together. If your main site draws a natural amount of traffic already, your secondary site can benefit from this popularity. And if you’re using WordPress to house your blog, this SEO boon is especially helpful. As a collection of keywords and attractive lures for new traffic, your blog is one of your most powerful SEO tools — if it’s on a different site, that’s a complete waste of potential. And because blogs are so powerful, they should be hosted on WordPress, which is generally recognized as the best platform for blogging. Originating as a platform for bloggers, WordPress has since expanded its capabilities, but has retained the same user-friendly interface for authoring content without dumbing down its more advanced features. Specifically, the beauty of WordPress for blogging is its inherent inclination for SEO. The coding itself, streamlined without excessive HTML, is attuned to Google’s categorization. On top of that, there are additional SEO plugins — namely Yoast SEO — to take this advantage even further. With close to 45,000 plugins, WordPress also showcases a broad range of customization and supported features, including monetization options. And with numerous forums for guidance, you can always find help just around the corner. Add to that the reliable security and recognized trust, and you see why it’s so popular. So even if you’re tied into a separate domain, it still pays to launch an auxiliary WordPress site, even if only for blogging. And with a reverse proxy, you don’t have to sacrifice anything. If this sounds like something that could benefit your site, let’s talk about how to set it up. While many managed WordPress hosting services do not permit WordPress Reverse Proxies, we’re proud to say that Pagely is one of the few that does. As an available perk to our VPS plans and higher, our clients can enjoy the benefits of a reverse proxy for an additional subscription fee to cover ongoing debugging and extra support costs. All our clients have to do is submit a support ticket, and our team then handles the set up manually. For specific details, read this entry in our support section or receive a quote now. WordPress is designed to support any genre of website from blogs to eCommerce stores (with the help of the WooCommerce plugin). Most of the time, you can build your entire site on WordPress, with its capacity to suit whatever your end goals may be. That said, there are some circumstances outside your control that require you to use a separate domain. As mentioned above, the most common are working with a large enterprise site or pre-established eCommerce stores in an umbrella platform. Even in these situations, you still don’t need to give up the SEO advantages and convenience or WordPress. 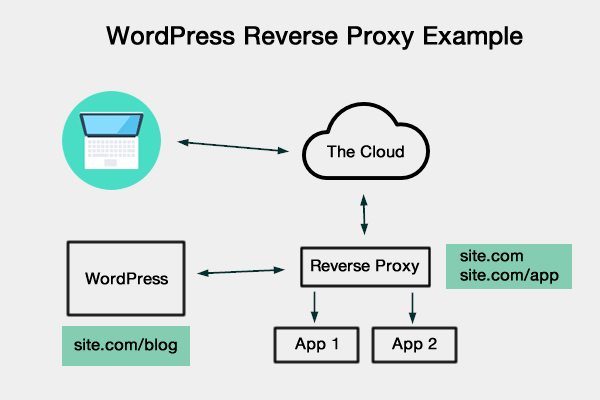 A reverse proxy gives you the best of both worlds — the benefits of WordPress without disrupting the setup of your existing site. What are your thoughts on WordPress Reverse Proxies? Does it sound like something that your site could benefit from? Share your thoughts and opinions in the comments now. Freelance writer and content creator, specializing in web design, eCommerce, and digital marketing.